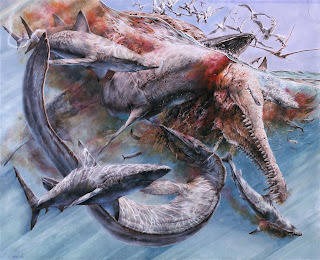 If there is any palaeoartist whose work is inherently suited to 3D, then it's Luis Rey. 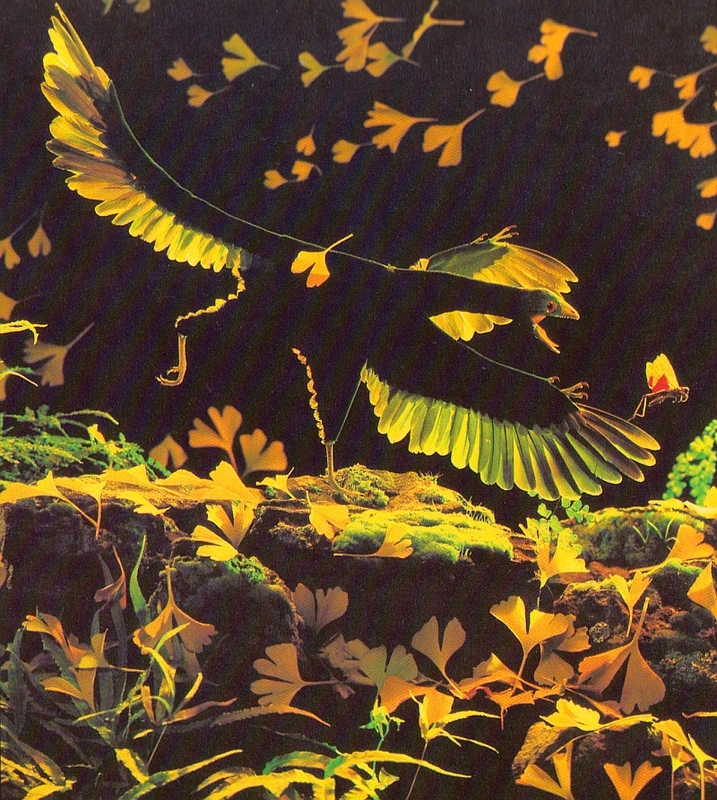 Thanks to his use of bright colours and wild perspectives, Rey's work often seems to be jumping from the page anyway. The combination of Rey's face-meltingly bright dino art, Robert Bakker's exuberant enthusiasm and very silly glasses is simply irresistible, not to mention ingenious. This is not only a fantastic kids' book, but far too much fun for any adult with a geeky bone in their body. Back to the task at hand. 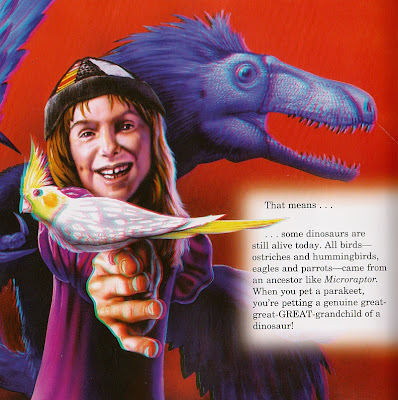 There are far too many dinosaur books aimed at children that are filled to the brim with terrible, terrible art - usually, these days, embarrassing digital stuff that ends up resembling concept art for an N64 game circa 1997. No doubt this is justified on the grounds that, hey, it's for kids, yeah? So, who cares? Well, damn it, children deserve good dinosaur books too. Although a lot of people aren't so fond of Luis Rey's style, he could never be accused of not doing his homework; in short, he knows his anatomy, and this is high-quality stuff. As is traditional, the book opens with a 'size comparison parade' of various giant dinosaurs, along with an elephant and, brilliantly, a human riding said elephant. It's beautifully executed, the 3D works excellently and Rey adds typical characterful touches, including a diminutive dromaeosaur and hypsilophodont running away to the left (out of frame here), both giving the viewer a knowing glance. This book is an excellent showcase of Rey's work, and popping on the 3D glasses instantly turns the pictures into wonderful dioramas - in spite of the book's title, there are actually next to no 'poke-in-the-eye' moments. Instead, the effect tends to be of meticulously arranged cardboard cutouts, like a pop-up book you can't break - which is fine by me. If you're only really familiar with Rey from the Holtz encyclopedia or Dinosaur Art, his illustrations of non-dinosaur animals (including prehistoric humans, one of whom sports a rather Bakker-esque bushy beard) will be of great interest, especially as the drab colours of large mammals naturally force him to rein in his usual bold style. As for the text - well, it's Bakker, so you probably already know what to expect. It can get a little twee at times, and he indulges in some plausible speculation that isn't signposted as such (see above), but then it is a children's book, and there is a need for the text to match up to Rey's exciting, dynamic illustrations. Being a palaeontologist, Bakker - like Holtz in his encyclopedia - has no qualms in explicitly stating that birds are dinosaurs (see below), which is definitely to be applauded in a book aimed at kids. Some people might take issue with his declaration that "modern-day birds are descendants of raptors", but it's perhaps worth considering that he could mean maniraptors as a whole as opposed to just dromaeosaurs. 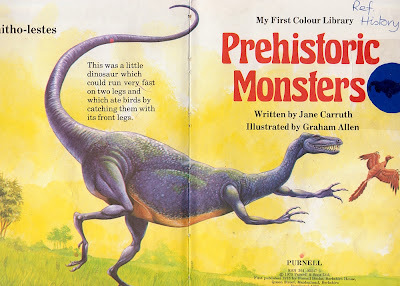 He should also be applauded for his frequent mentions, in characteristically lively prose, of the fossil evidence behind (most of) the assertions about dinosaur behaviour, which really adds to the exciting feel of the book - these events really happened. Fellow Brits will also find the pronunciation guides rather amusing ("pay-lee-uhn-TAH-luh-just", "GLIP-tuh-dahnz" - Americans, bless 'em). 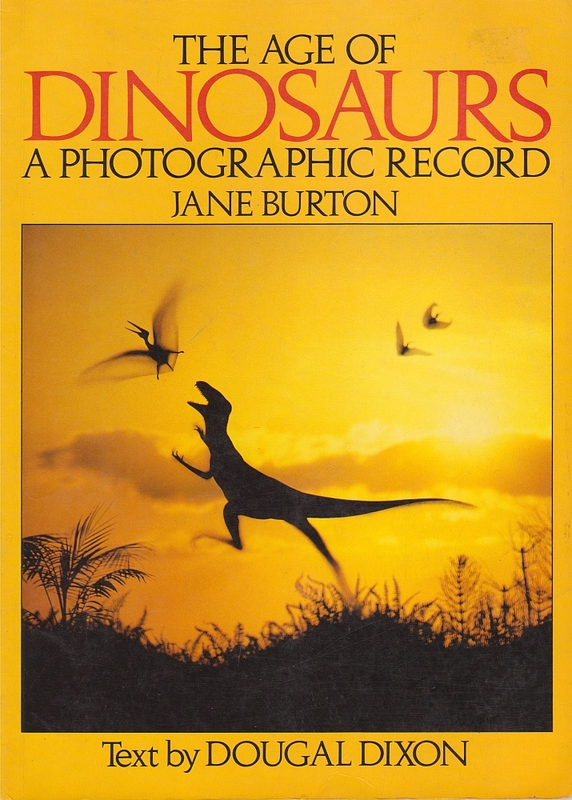 If your delightful progeny are of the sort who get in my way when I'm visiting a natural history museum, and eat up any dinosaur books they can lay their hands on, then you absolutely have to buy them this book. Consider that an order. They'll absolutely bloody love it and, what's more, it's cheap for such a quality product - in the UK, under a fiver on Amazon. 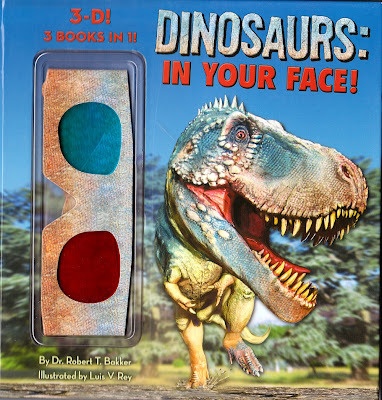 Even if you're a grown-up dinosaur fan with a healthy appreciation of lovely, vibrant palaeoart and good old-fashioned bi-colour 3D glasses with a scaly pattern printed on them, you're bound to have fun with this book. Let's face it, you'd only spend the money on bottles of ale otherwise, and they aren't good for you, you know. Or so I'm often told. Please do heed this warning, however - this book does have one unutterably terrifying in-your-face 3D image, and it happens to be a sojourn into the darkest depths of the Uncanny Valley. I have semi-legally scanned it in the name of providing readers of this blog with an advanced warning - better you know it's coming, than to suddenly turn the page and be confronted with...that face. Actually, I'm tempted to turn it into a Halloween mask. What do you think? Here's a quick one just to keep things ticking over. I recently acquired a kids' book from 1975 entitled Prehistoric Monsters (the things I buy on eBay! ), and was a little upset to discover that it was filled with the standard, mostly quite competent Burian and Zallinger rip-offs. Therefore, it didn't seem quite up to being reviewed here in full. However, illustrator Graham Allen did furnish us with one rather remarkable piece. And here it is! Now, I'll grant you that Ornitholestes was a slightly strange theropod anyway, but this is just fleeing at breakneck speed with the cake. It looks like it's made out of the disparate parts of several different creatures! Of course, it's also yet another entry for the Bird Grabbin' Ornitholestes Hall of Fame, complete with teeny-tiny Archaeopteryx. Literal artistic interpretations of dinosaurs' names can be rather fun; won't anyone consider drawing a T. rex dressed like Henry VIII? Pretty please. Make him nice and portly too. So, sorry about the short 'picture of the day' post (not to mention that title - such crude alliteration being a great affront to the aesthetic sensibilities of the high-minded and literary gentlefolk to whom this blog is dedicated). 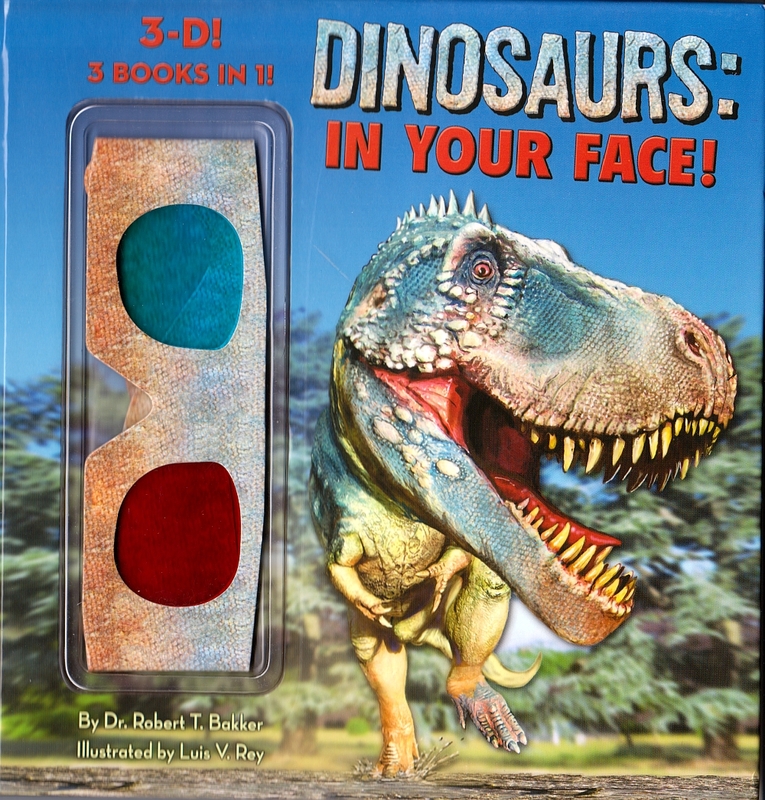 If it's any consolation, I've ordered - and plan on reviewing - Bakker/Rey's Dinosaurs - In Your Face!, and will be sure to feature suitable shots of me looking very silly in 3D glasses. Precisely the way to start off the weekend. What's the best thing about this little video? Is it the funky little 80's beat? Is it the constantly open mouths, clean and pristine because metallic jaws are incapable of slavering? Is it the occasional unconvincing rumbles? The majestic way these chrome behemoths slap across digital salt pans? ....it's probably the funky 80's beat. As I recently posted, I've started a shop at Redbubble, a site which allows artists to sell their art and design on a print-on-demand basis while still providing a high-quality product. That's one of my recent additions up above, which has wound up being more popular than I expected. I've been very happy with the site so far, and I've thrown myself into it with more enthusiasm than the other web marketplaces I've explored. Of course, I immediately started scouting for good paleontologically inspired artwork. With prime gifting season barreling towards us, you may just get a few ideas. All images are copyright to the individual artists; click their names to see their shops. I have to start with Glendon Mellow, since he was how I found out about the site, long before I had a body of work to stock my store. If you're not familiar with his work and writing at The Flying Trilobite and Symbiartic, his Redbubble shop is a good way to get up to speed. His distinctive take on science-art, joining scientific concepts and artifacts with surreal imagery, has gained him many admirers, but you'll also find his wonderful beetle illustrations, his trilobite zodiac designs, and, appropriately enough for our purposes, a couple of charismatic saurians, such as the Avimimus above. Scott's dinosaurs aren't strict representations of animals in natural environments; rather, he uses bold juxtapositions of color and pop art techniques in compositions that playfully emphasize the pure forms of the animals themselves. I feel a real kinship with him based on our backgrounds in design, and I love the way he spins that in a totally different way. Follow his work at Cyrillic Typewriter. Like Scott, Raven brings a designerly touch to her dinosaur art, and I love her explorations of historical aesthetics: in particular, her Art Nouveau design of a drinking Troodon. 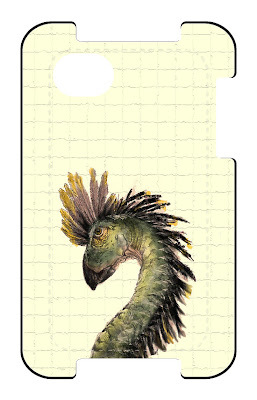 She's also done some mock branding for Mesozoic-inspired products. Like Glendon, she's using the zodiac to structure a project, illustrating dinosaurs that cleverly refer to the zodiac symbol (such as her Cancer Conchoraptor). Check out some great work-in-progress posts at the Caw Box. I would be remiss if I did not mention Scott and Raven's Indiegogo campaign to support their January Archosaurs and Automata art exhibition. Go there! 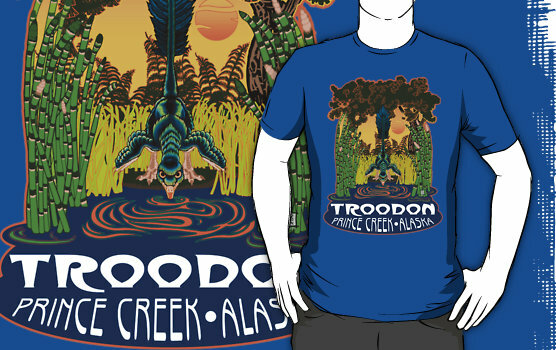 Niroot is another recent Redbubble recruit, which may have been spurred my tweeted insistence that he give it a shot. 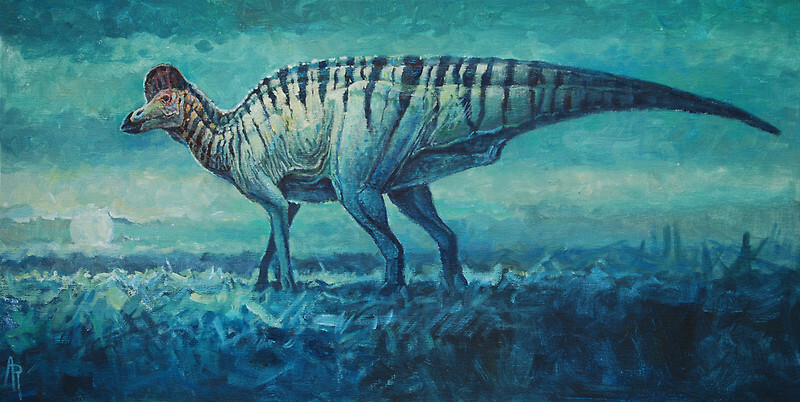 Longtime readers here will know of Niroot's work well, his fanciful take on dinosaurs that nonetheless have a presence as if having been drawn from live models, as in his "field sketch" of an Olorotitan herd. Also: Triceratops on a bicycle (which has the most adorable handlebars imaginable). If you're not following Niroot at Himmapaanensis, you really ought to consider it. Jaime will also be known to readers as the writer behind The Bite Stuff, but he's also an accomplished artist. 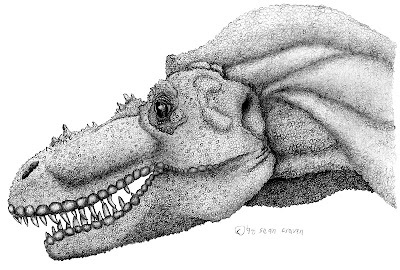 As his interest in chompers may suggest, Jaime has rendered some absolutely lovely stippled illustrations of dinosaur skulls, and for the very nerdy among us, his skull cross sections would be a heck of a conversation starter. In the right crowd, naturally. 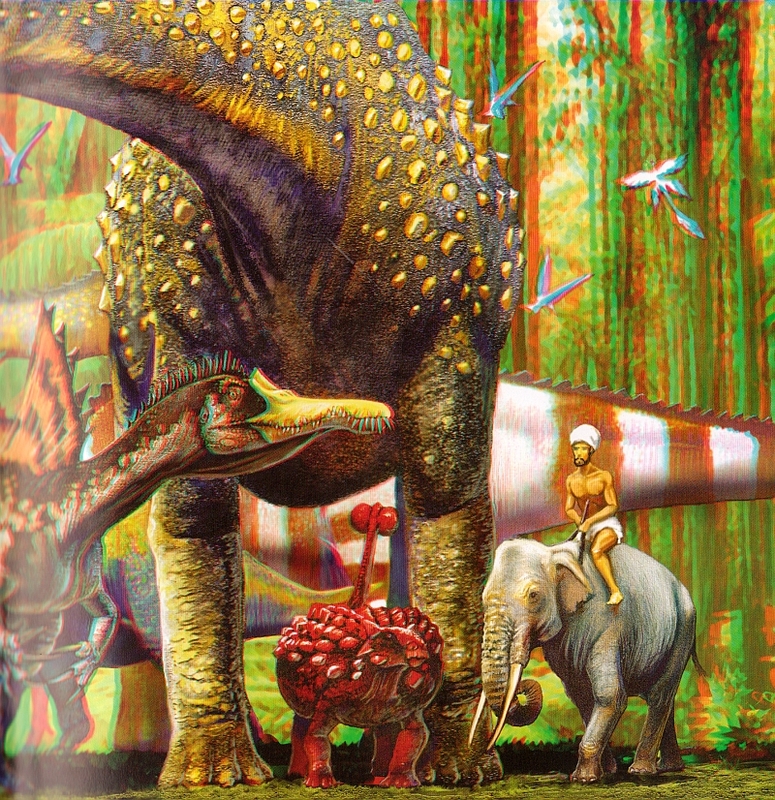 Another paleoartist with an uncanny command of color, Angie's hadrosaurs in particular blow my mind. Her brushstrokes are bold and add a sense of drama to her work, even when it's just a simple composition highlighting the animal front and center. Also available are some beautiful works devoted to extant mammals. You can find more venues from which to purchase her art at her blog. Sean Craven's shop includes a mix of the forms I've written about in the other artists' sections: there are pen and ink profiles, skeletals, and simple designs in striking color. 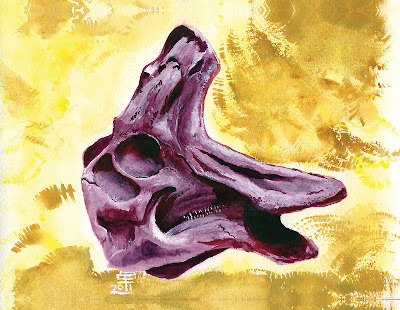 His studies of bones, as part of his Bonelands series, are a treat, lit in odd hues. Most importantly of all though, where else are you going to get a print of a crapping Stegosaurus? Follow Sean at Renaissance Oaf, as well. If you like Julius Csotoni's Futalognkosaurus dukei, which I do, you're in luck! It's the single piece he's got available. Maybe if he sells a few he'll add some more. Julius recently jumped into the blogging world as well, at Evolutionary Routes. One thing I've heard from my very kind patrons is that they are impressed by the generally high level of artistry found on the site as well as the usability of the site and its good customer service. As a Redbubble customer myself, I'm thrilled with the speed of order processing. I ordered a print last Friday and it arrived on Monday, with care taken. It shipped in a sturdy tube, wrapped in tissue paper for stability, with a band of paper to keep it rolled up instead of tape. So I can confidently recommend patronizing all of these paleoartists. Niroot reports that the cut he recieves from each print sold on Redbubble is less than that of DeviantArt, so do support artists that choose to market themselves there. It's an interesting contrast: the two sites take opposite approaches, with DeviantArt supporting a more robust set of community features and Redbubble presenting itself as more of a storefront. As artists and patrons get used to the on-line marketplace, it will surely continue to evolve. Still, I can confidently invite others to join this small Redbubble paleo community. As with any online art community, it has its fair share of pop dinosaur art that isn't concerned with staying true to the integrity of the living animals as revealed by paleontological research and informed speculation. And that's fine; I love Yoshi and other cartoon representations, the Jurassic Park raptors, and B-movie monsters. That said, many of us have a deeper appreciation for artwork that doesn't play fast and loose with forms, finding much aesthetic merit in anatomical fidelity. Of course, feel free to add to this list in the comments. I love how the shiny digital future has opened up so many artists' processes to a wider audience. A primary message I impart to my students - which I pummel them with all the time - is how important it is to invite critique throughout the creative process. I teach graphic design, but it's a practice that can certainly apply to other disciplines. All sorts of artists can share the development of their work as it evolves beyond a peer group at hand. It's not for everyone, of course, but I appreciate being able to look behind the curtain. It enhances my appreciation rather than ruining the mystique of the vaunted final artifact. So here's a new version of Utahraptor, shared by Paul Heaston at Flickr. A previous draft received some constructive criticism from Mike Keesey. So cool to see. More from Paul at his blog, and of course my recent interview with him. And this isn't the first time I expressed this sentiment about Paul's work. This Utahraptor was just too cool to not post. Important programming note: Do not restore the current skeletal reconstruction. Utahraptor does NOT look like this. It's stranger and less Deinonychus-like than I realized. Unfortunately I can't share the changes with you just now, but I didn't want anyone else to put time and effort into restoring Utahraptor from an outdated skeletal. Further bulletins as events warrant. Cannot wait to see how Utahraptor changes with this new research. 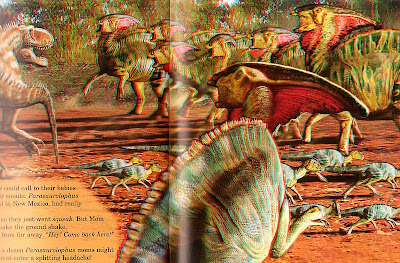 Recently, we here at LITC did a tag team review of the recent Dinosaur Art, a ponderous tome of paleontological renderings and antediluvian art pieces. Despite some issues with the book, we agreed that it was a gorgeous bit of work and a very nice accomplishment. Still, we had some questions. And who better to answer them then the book's mastermind himself? Steve White has been a comics writer and editor for a long time, working on Marvel UK's comics line and writing for 2000 AD and other British comics magazines. 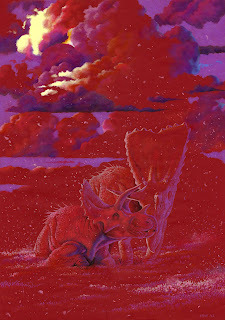 He's also an excellent, dynamic artist in his own right, with interests that range from pulp to paleoart. He blogs at Thunderlizard, currently edits the licensed comics The Simpsons and Transformers, and has an inordinate fondness for Triceratops. Steve was kind enough to take some time to answer a few questions about the book, where he sees paleoart going, and his own artistic sensibilities. 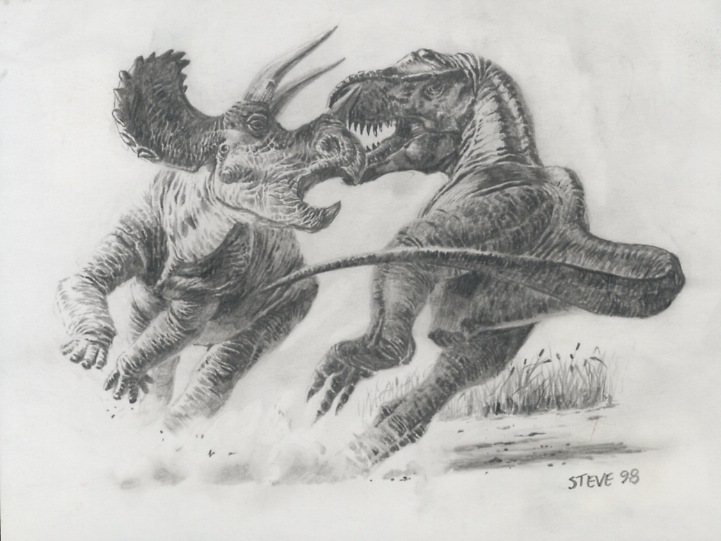 Steve, how has your work in the comics industry affected your taste in paleoart? I think it's tended to make me a little over-zealous when it comes to dynamism in my own artwork – I guess that was how Dan Varner came to call me the 'John Milius of paleoart' when he was describing a marine feeding frenzy I did a few years back – I'm hoping he meant in the Conan sense and not in the Red Dawn sense. I always had this theory that I should have as few feet on the ground as possible and have my subjects at crazy angles like they were taking corners at high speed. Also lots of dust and debris being kicked up. Two of my favourite artists are Frank Frazetta and Berni Wrightson, both of whom included dinosaurs as a matter of course in their work. I'm also a huge fan of Mark Schultz (Cadillacs & Dinosaurs) - another dinosaur aficionado whose work, especially his Centrosaurus pieces, are wonderful. I guess I look for a similar sense of dynamic action in paleoart. I still think Charles Knight's leaping Laelaps are incredible, even now, a century on, and it's what drew me to Greg Paul and Bob Bakker's work in the '70s - they had great motion in their work. I suspect this is all driven by my love of comics. Dinosaur Art contains a wide and interesting variety of artists. How did you decide whom to pick, and why did you chose the specific ones you did? Hmm. This was always going to be difficult. From the moment the book was conceived I had a rough list of artists I wanted to include. I asked everyone on it assuming there would be a percentage that would decline, and that did indeed turn out to be the case. As such, there have been a number of comments on the book saying so-and-so was was left off or not included. Well, pretty much everyone mentioned was asked and declined for whatever reason; to have got the book I truly wanted would have cost a lot more money and been twice as large! But no one was deliberately missed off. And of course you're never going to please all the people all the time. Luis Rey has a style not to everyone's taste yet so many people have said me he is their favorite. If this sounds a little defensive, it probably is. I think we performed a minor miracle in getting this book out at all and everyone involved went way about and beyond what was needed. And on a personal note, I took great satisfaction when some people said "You'll never get Greg Paul," when ironically he was one of the first to come back and say, "Yep, that's doable." To me he was the most important artist to get in the book simply because his influence has been so prevalent in paleoart. I can't believe anyone would think otherwise. So how was the art for each artist chosen? That was actually the greatest part of the book for me. We had so much art that went unused and in some cases there were some very tough choices to make. A few of my personal favourites didn't make it in. But generally, the artists would send in their personal selection and then I would make a folder called 'priority' – it was like battlefield triage, picking the ones I thought should make the final cut! The choices were usually based on things like rarity – wherever possible, I didn't really want images that were pretty well known (of course, we did succumb to that on a few occasions); I also tried to select of mix of common animals that would be well known to the general public, and newer or less well known types in an attempt to try and offer something to everyone. Once the choices had been made and the pages laid out, I would send a PDF of the section to each individual artist for comments. In a few cases we made changes, including a very late substitution when Unescoceratops and Gryphoceratops were unveiled using a lovely piece of Julius Csotonyi's art. I really wanted that included and it was dropped in on the day before the book went to press! Dinosaur Art seems to split the middle ground between un-annotated finished art and process sketches. Could you go a little bit into the process behind how the book was edited and put together? From the start, there was some discussion over whether this was an art book about dinosaurs or a dinosaur book that happened to include a lot of art. The former won out because that was the editorial tack I was going to take; from the the start I had wanted to include the Q&As, but to give it a certain intellectual weight, we included the animal spotlight sections. I also figured there'd be a certain amount of academic discussion within the Q&As as a matter of course, the point being that paleoart is art and science more or less hand-in-hand. I also made it clear that this wasn't going to be just dino-centric, hence the inclusion of Mauricio Anton and the focus on pterosaurs in John Conway's section (again, this seems to have ruffled a few feathers, so to speak, with regard to the book's title, but again, we had to include 'dinosaur' in the title; you have to be realistic and go with what sells - this was after all a generalist, populist book). So, with the notion that it was going to be an art book, it seemed to only natural that the art should reflect the text – I was keen to discuss style and method with the artists so showing the stages of their work made a lot of sense. What was interesting was the different approaches to this amongst the artists. Some, such as John Sibbick, Doug Henderson and Todd Marshall, had masses of extraneous material – sketches, roughs, spot illustrations, everything – that enabled us to show stage-by-stage development of their artwork. That was definitely an area we could have expanded on. Some, however, had no developmental work or were not interested in showing it; to them, the end result was all that mattered. The actual nuts of bolts of the editing process involved myself, my in-house editor, Jo Boylett, and the book's designer, Barry Spiers (I am actual senior comics editor at Titan so this was something I did freelance for the company). 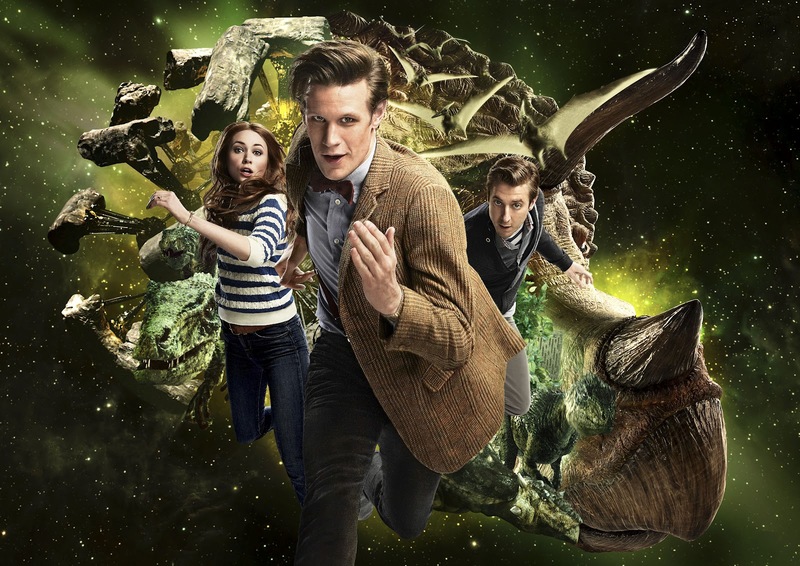 Both underwent a crash course in paleontology during the editing, which actually was completed in about three months – January to March 2012. Prior to that I had subbed and proofed and formated the Q&As, and sorted the initial selection of art. Once the format was decided upon we were given the nod and away we went. I was terrified we'd never make it yet somehow the whole thing seemed to go relatively smoothly. Considering some of the work I've done – where you close to going postal by the end – it was a joy to behold and Jo and Barry performed miracles to produce what I think is a thing of beauty. The icing on the cake was the advance copies arrived on my birthday! I discovered how it feels to be a father! Was there anything you wish you could have done with the book that you couldn't? What would you like to see in a followup? Well, as I mentioned before, there are several artists I wished had decided to get involved. On reflection, I also really should have included female artists and at least one sculptor – I hope to rectify that if and when we do a second volume. Which segues quite nicely into the book's title which is rather definitive, but sure I can work around it! I was talking to Dave Hone recently after he had reviewed the book and he made an interesting suggestion – one that I had touched on but hadn't really followed through with. He thought it would have been fascinating to include reconstructions of the same animal by different artists, on the same spread. It would give you a more immediate look at how different artists approach the same problem of illustrating the same extinct organism. 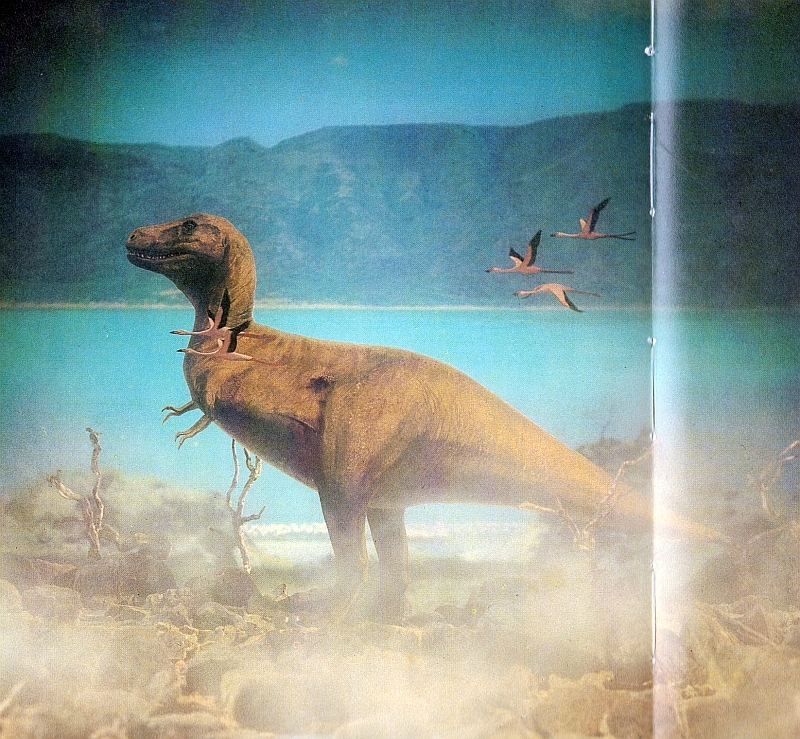 I had Gigantoraptor in mind when I was thinking about it – illustrated by both Luis Rey and Raul Martin. But that would definitely be an interesting concept. Looking back I think I'd want to include more stage-by-stage developmental work as well. Something else would be the inclusion of new technology such as augmented reality - an app where you wave your smartphone over an icon on the page and it downloads extra material to your phone. You could include actual tutorials with the artists or interviews, that sort of thing. Building off that, there seemed to be a heavy emphasis on digital art in many sections. Was this a conscious decision? No, not as such. Some of the artists had begun to produce digital art as a matter of course – Julius, Raul, Luis, Bob Nicholls, Mauricio, John Conway. In some cases, it was the bulk of their work so I was naturally inclined to use more of it; in other cases, such as Bob and Luis, I used a more balanced mix. In Bob's section I think I was about a 50/50 split, although the largest images printed were his traditional work. But again, I wanted to use a lot of digital stuff to emphasis the various approaches to using software as an art tool. Where do you, personally, see Paleoart headed in the future? I guess the book proves that digital seems to be the way forward. I like to think that some of the Old Guard will continue using traditional methods (I know I will...), but already several have made the switch, while the new generation have more or less put aside basic traditional tools and are using graphics pads and Photoshop as their starting points. I think this is a good thing because it will spare us from some of the truly dreadful digital art that blighted popular dinosaur art in the fallout from Walking With Dinosaurs. We'll have new paleoartists completely proficient in the digital medium as opposed to computer artists trying to draw dinosaurs. It's also been interesting to see the likes of John Conway moving into animation. With that sort of technology and software becoming freely available, I would assume it's only a matter of time before paleoartists are not only producing digital art but digital animations. Finally, what up-and-coming young paleoartists do you have your eye on? And there you have it, folks. Many thanks to Steve White for agreeing to this interview. His various art and musings can be seen in their majestic native habitat over at Thunderlizard. Paleontology is a field full of holes. There are gaps in the fossil record obscuring evolutionary transitions, and most of the taxa we know and love are not known from complete remains. Then, there's the lag between a taxon's discovery and comprehensive study of its fossils, which can take decades. Dryptosaurus, the New Jersey tyrannosauroid formerly known as Laelaps, is one of those obscure animals that languished for years, thankfully receiving more attention recently, employing today's more robust paleontological methods. 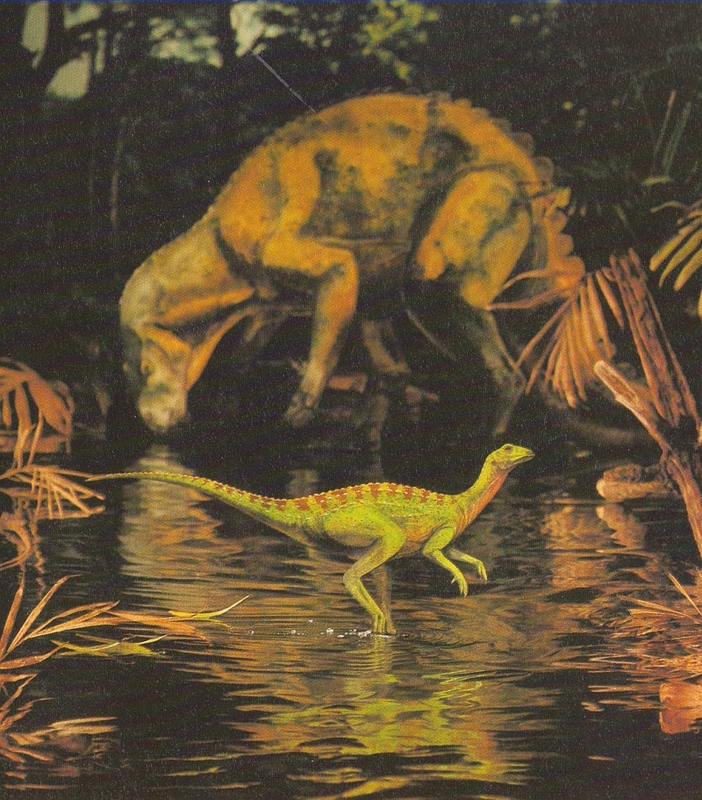 Last year, a new assessment of Dryptosaurus was published by Steve Brusatte, Mark Norell, and Roger Benson. Tyler Keillor, an Illinois paleoartist, is setting out to build on the study substantially. 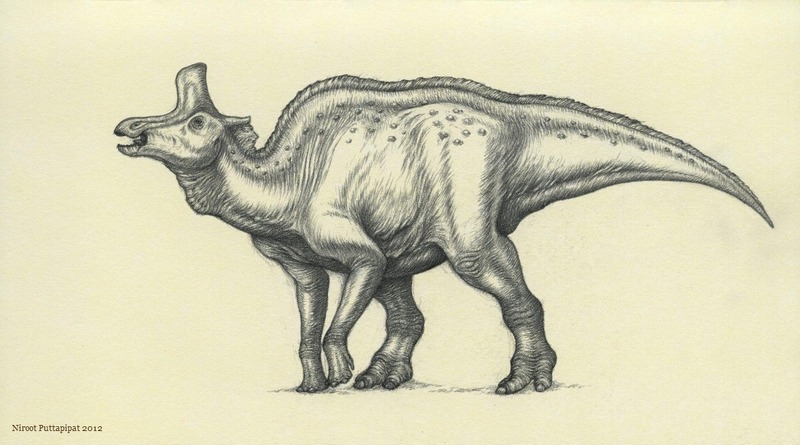 With Kickstarter, the crowd-funding platform, he's attempting to raise the money to create a high-quality, accurate reconstruction of Dryptosaurus. My Kickstarter plan is to create the most realistic, accurate, and up to date life-reconstruction of the predatory dinosaur Dryptosaurus. Surpassing the traditionally sculpted life-sized dinosaur busts I've become known for, this will be a full body digital sculpture. I will use the latest paleontological information as the foundation for my creation, and have my work reviewed for accuracy by paleontologist Steve Brusatte, lead author of the most current in-depth study of Dryptosaurus. My references will also include discussions with paleontologist and theropod expert Dr. Thomas Carr. This is a potentially powerful way for paleoartists to make important contributions to public knowledge without having to rely on commissions or commercial projects, so it would be amazing if paleontology enthusiasts contributed en masse. Here's Keillor's video pitch, part of the requirement for launching a Kickstarter campaign. Again, check out Keillor's Kickstarter campaign page. If you're unfamiliar with Kickstarter, keep in mind that your pledge will only be required if the project goal - in this case $6,000 US - is met. In the few days since the campaign began, Keillor has reached just over half of his goal. He has until October 7 to make the remaining $3,000. Thanks to Domain of the C-Rex for the tip off. 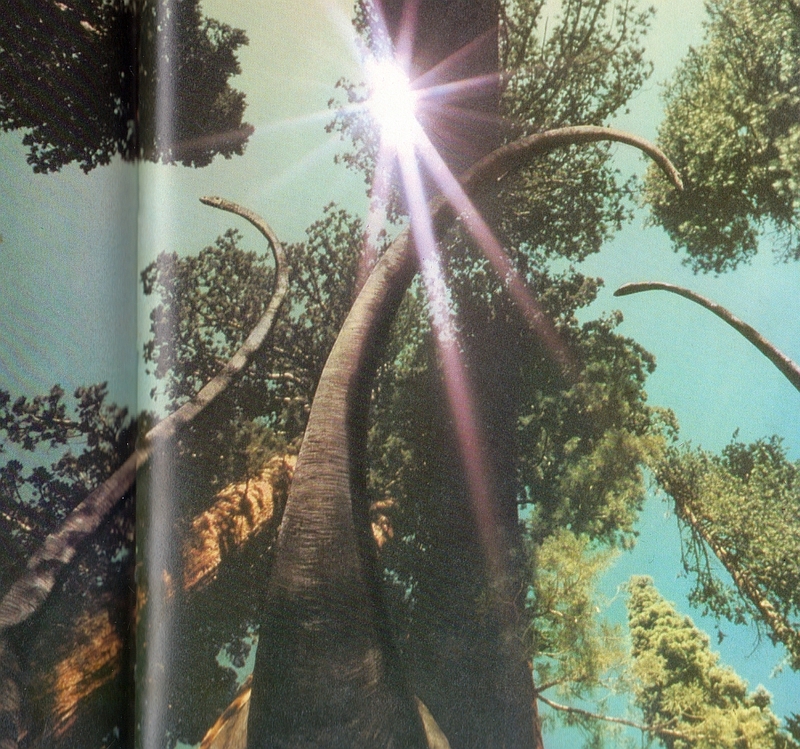 There's that smell in the air... it's time to dip back into the paleoartistic publications of Rourke publishing. It's hard to believe that it's been three months since the last visit to the series: those were the halcyon days before Marc blew our minds with an explosion of Sibbick-itude heretofore unseen on the web, then followed it up with an equally epic exploration of Zdeněk Burian. Now, we'll come back down to Earth and the muddlings of work-a-day illustrators with a 1984 publication devoted to the poster-child of the Dinosaur Renaissance, Deinonychus, the theropod who so ably served as the world's favorite dromaeosaur until that greedy little usurper wrought by Crichton and Spielberg pounced onto the scene. These scans were kindly provided for our pleasure by Terry Thielen. Even without the publication date provided, we'd have a rough idea of where we are; the first spread is a clear depiction of pronated, ready-to-dribble-a-basketball theropod hands, of the sort that makes the modern, discerning dinosaur fan cringe. 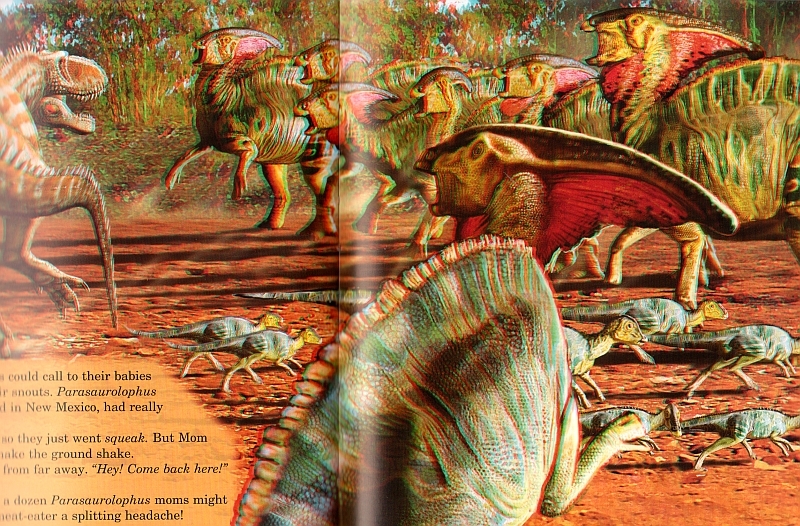 Illustrator Roger Payne is middle-of-the-road among the Rourke stable; nothing too daring here, with bright colors and de rigeur plain green color schemes for his dinosaurs. Feathers are absent, naturally. 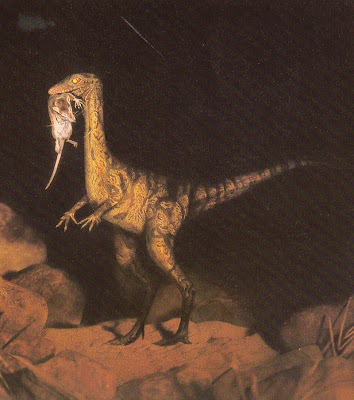 But Deinonychus is an active predator, chasing after his prey, as with this hapless Psittacosaurus, and in this he fits squarely within the renaissance ideal of a warm-blooded, speedy killer. The animals were roughly contemporaneous, though they hail from North America and Asia, respectively. Attention to paleoecology is a hallmark of these titles, as anachronisms tend to be fairly minor. 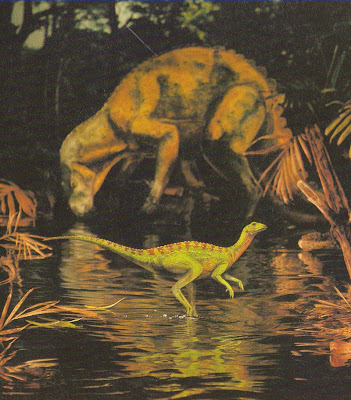 Here, the titular theropod does his business in an environment that suitably passes for a hot, tropical floodplain. There are some distant mesas as well, because, well, what in the heck else are you going to stick on the horizon? (Note: check comments for some discrepancies noted my Mike Keesey, which I did not bother with or pay attention to in my haste to finish up this post). Rourke titles tend to end one of two ways: in death or slumber. Fearsome Deinonychus gets the latter. It's actually sort of notable: besides a fellow who goes by the initials GSP, there were not many images of theropods at rest in the paleoart canon at this point. Here, those pronated hands rest atop one another in the manner of a sleeping dog; poor thing lacks a proper coat of feathery integument and hands arms that fold up in the fashion of the animal's extant relatives, the better to tuck a cold nose into. 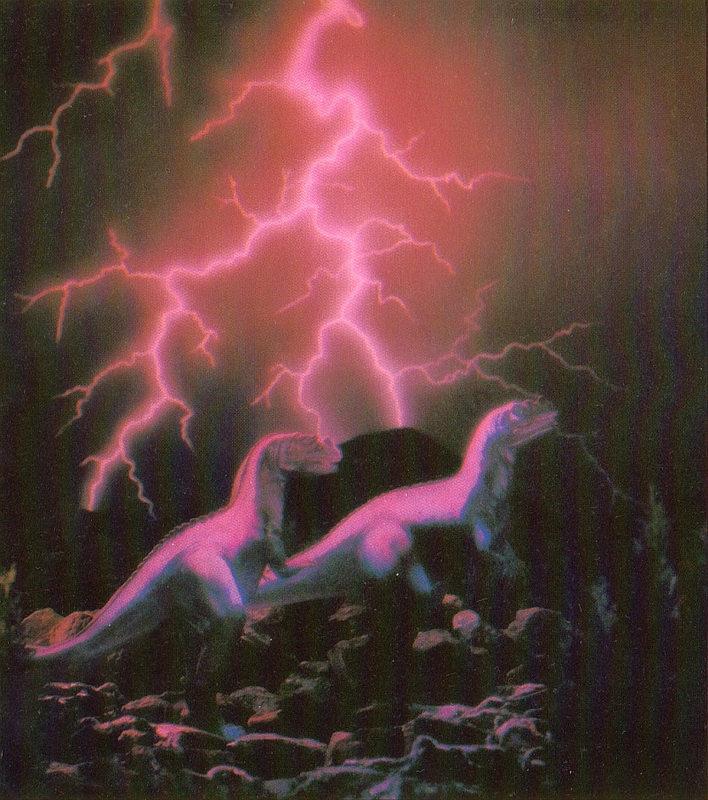 As always, browse the Flickr Vintage Dinosaur Art group for much more saurian goodness. For the first time since it was revived back in 2005, Doctor Who featured some tasty nonavian dinosaur action last night. Not only that, but they were dinosaurs in space (one has the distinct feeling that the title of Dinosaurs on a Spaceship came before the script). It was an absolutely brilliant episode that moved at a scorching pace, bringing together not only the Ponds but also Rory's dad alongside Queen Nefertiti and an Edwardian big game hunter. Of course. 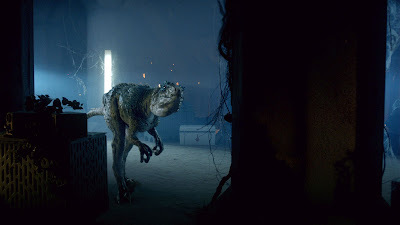 Now, don't get me wrong; while I am a massive geek - as is evidenced by my writing about Doctor Who on a dinosaur-related blog - it would be really daft to seriously critique the show's dinosaurs based on their scientific accuracy. The first two dinosaurs in the show (in the pre-credits sequence, in fact) were ankylosaurs, which I thought was an excellent move. Although well known by those with even the slightest interest in dinosaurs, ankylosaurs are certainly not as familiar to the public at large as The Usual Suspects (Tyrannosaurus, Velociraptor, Stegosaurus etc. etc.) Moreover, they are certainly very dramatic-looking animals, and capable of wreaking a suitable amount of destruction. 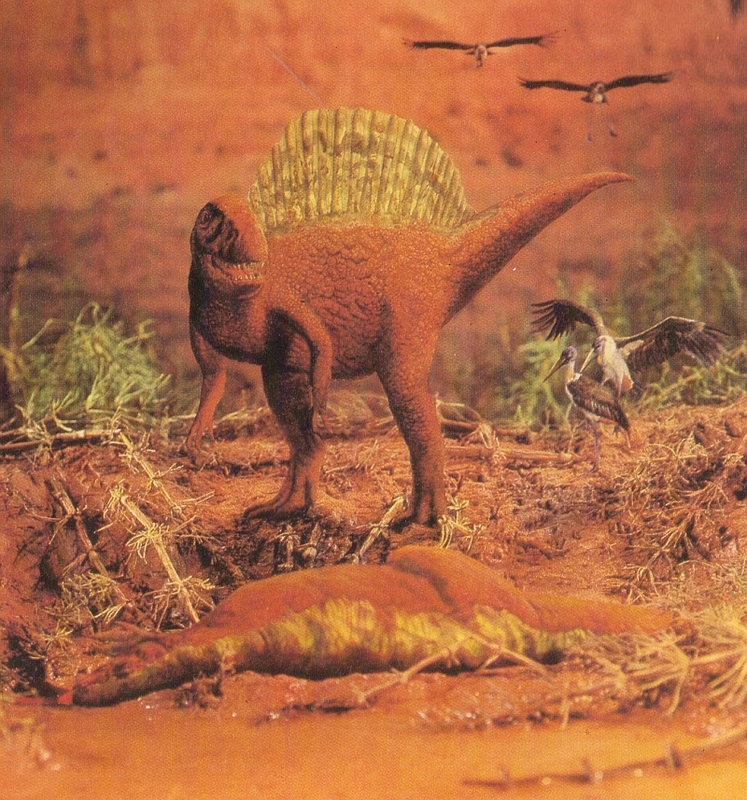 The animals in the show were clearly modeled on Euoplocephalus tutus, although they were never referred to as anything more specific than 'dinosaurs'. In spite of this, they were remarkably well done - although only enjoying a brief screen time, one could see that they had been accurately given wide-gauge hips and the right sort of armour even if they were probably a bit oversized. Check them out on YouTube. The real saurian star of the show was a Triceratops, nicknamed 'Tricey' by the Doctor. It was realised by a combination of CGI and animatronics, with the Doctor and crew even hitching a ride on a real puppet front half. Any faults that it had were quite minor, all things considered - the hands weren't quite right, and the neck frill wasn't exactly the right sort of shape, but it certainly could've been a lot worse. Some people may have flinched at its characterisation as an adorable dog-like beast, but it's Doctor bloody Who. I thought it was wonderful, and was really quite sad when (spoilers!) the villain's two childlike pet robots exterminated it. 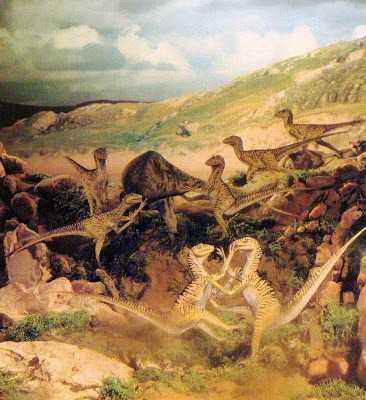 In fact, the only rubbish dinosaurs in this show were theropods - surprise, surprise. Amy, Nefertiti and Big Game Hunter Man stumbled upon a sleeping juvenile tyrannosaur early on in the show, and it appeared to be a bit tubular, without shoulders to speak of. Far more important than that, however - in that they actually had a significant role to play - were what everyone referred to as 'raptors'. Alas, Doctor Who trotted out the usual silly Jurassic Park-esque bunny-handed monstrosities, virtually devoid of feathers. 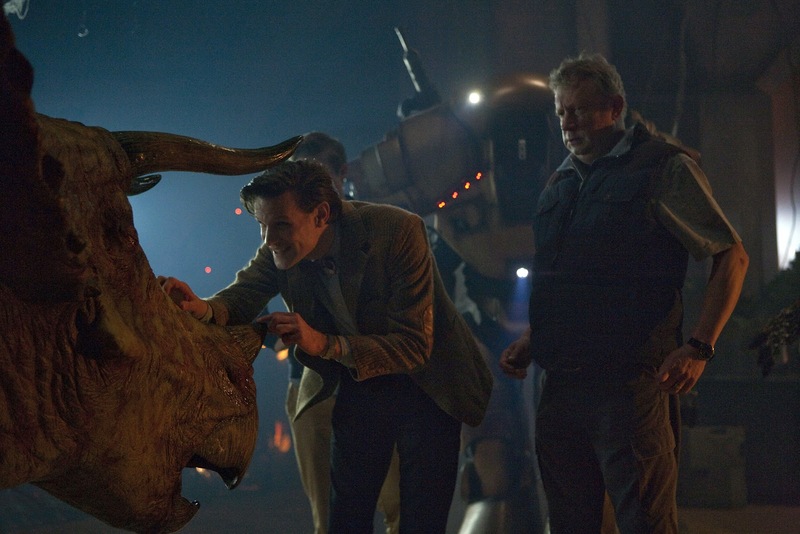 It is worth noting, however, that they were not the same CGI models as used in Primeval, as some people have concluded - they were made from scratch by a different special effects studio. Any similarities are a result of the convergent need to rip off Jurassic Park. Of course, the dinosaurs had spent over 65 million years on board that spaceship, in which time they might well have evolved bunny hands and a sparser feather covering. Stranger things have evolved. Removing my tongue from my cheek, though, I must reiterate that this was an excellent episode - an absolutely inspired maelstrom of time and space-spanning lunacy. Also, I absolutely LOVED that Earth's primary space agency was apparently Indian. Oh, and there were some pterosaurs too. 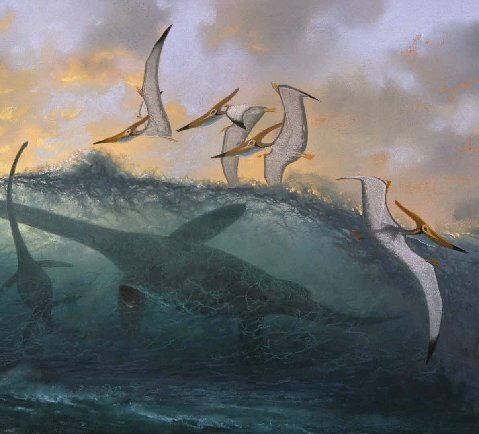 But nobody cares about pterosaurs, especially Pteranodon longiceps. Yawn. I want to be Brian Switek when I grow up. The guy gets to write about dinosaurs all day long, and not only that, but he's paid for it and people read what he has to say. I'm in awe..the jammy git. This is a somewhat belated review of his last book (there's another one out in the not too distant future! ), and I must say up front that it is really rather enjoyable. Given that it's old news, I'll try and keep this brief. A lot of what Switek offers up here will be familiar to the average reader of this blog, but contrariwise a lot of it probably won't be; certainly, I learned a fair amount about the complex evolutionary history of whales and, in particular, horses from reading this book. While the feathered dinosaur stuff won't be anything new, you're almost certainly going to learn something. Moreover, even if you happen to be, say, a bona fide scientist (don't laugh - we do have some of them turn up here) with a specialism in a relevant field, it's possible to really appreciate Switek's passion for the subject matter. Most readers will probably be familiar with his blog writing, and while that's certainly very good it is nevertheless difficult to deny that Written in Stone is a cut above. This is particularly true of the final chapter about human evolution - Switek builds to a Big Finish that puts us firmly in our evolutionary place and, happily, smacks down the silly idea that the evolution of a humanoid creature is somehow inevitable (as exemplified by the 'Dinosauroid', which I must apologise to certain people for mentioning again). After all, "we are creatures of time and chance". By the same token, Switek's chronicling of the earliest days of palaeontology is not only fascinating in itself (even if a lot of it will be familiar to those who have read, for example, Deborah Cadbury's The Dinosaur Hunters), but one can't help but make the connection between the repressive influence of religion back then and the apparent resurgence of fundamentalist nonsense today. What's striking is just how much quicker scientific progress might have been if the thinkers of the 18th and 19th centuries did not view the accommodation of religious views a necessity; either out of genuine piety, or because religion held such power in society. It's also amusing just how closely some of their views, long since revised and/or abandoned, resemble current creationist thinking. Enough about all that, though - I mentioned horses a couple of paragraphs back, and indeed the chapter on horse evolution is one of the best; it not only chronicles the earliest discovery of potential ancestral horses, but brings things right up to date by blowing away any preconceived notions you might have had about a 'chain of progress' in horse evolution. The idea that evolution necessarily presents orderly 'progress' or 'improvement' is a false paradigm* anyway, but the neat progression from a small, multiple-toed animal up to a large, single-toed one remains a persistent meme. Hopefully, people picking up this book for the dinosaurs and whales (ahem) will learn a lot about just how crazily branching the 'tree of life' really is, especially in the light of the fossil evidence we now have. As Switek puts it, "living horses are just the last remaining twig of a previously much richer family" - and he says much the same about elephants in another excellent chapter. Ultimately - without wishing to blather on too much - this book serves as a marvelous refresher in the bamboozling complexity of the evolutionary history of life on Earth, and even of what might be considered quite small clades, relatively speaking. It's also a riveting tour through the history of palaeontological discovery. This is The World That Was. Volcanoes belch gobbets of lava into the permanent twilight, their Olympian fires raging above the steaming jungles, and amidst the shadowed tree trunks shamble a swarm of horrors. Strange cries echo through the twisting undergrowth, a deafening cacophony out of the deepest antediluvian hell. Every thing that lives, everything that breathes, hums with the same primal madness. Red skies above. Red blood below. Red, red, red, in bone and tooth and claw. And then, silence. The volcano casts its red glow against the sky. The horrors recede, skulking backwards into the dark, their staring eyes wide and expectant. And out from the shadows, coming on gargantuan legs, tiny arms tucked against his craggy chest, teeth bared, eyes blazing, comes the reddest one of all. It's a Tyrannosaurus. Yet it barely resembles the living creature that once stalked the world. It is instead something grander and stranger, an Ur-Tyrannosaur, the idea of the beast made flesh. A Devil Dinosaur. Fast forward several million years and hop a few dimensions over. It is some time in the early 1970's, and Jack Kirby, the renowned king of comics, has begun playing with an idea. Creator or co-creator of heroes like Captain America, Thor, The Hulk, Iron Man, and the Fantastic Four, Kirby has been in something of a slump. For years he's been occupied with "The World That's Coming," beginning in the pages of DC Comics' OMAC and culminating in his post-apocalyptic serial Kamandi. But DC is going through troubled times--series being canceled left and right, explosive fights between editorial and the publisher. The bombast of the 60's is dying, and DC lurches toward social consciousness and hard traveling heroes. Mad ideas are out. Strange worlds are over. Comics are for grownups, these days. But Jack Kirby isn't interested in realism. Short, bespectacled, a cigar smoldering in his mouth, he's always dreamed of wilder things. So he returns to Marvel Comics, to the company that he helped build, his restless mind already turning to a different subject. He pitches them a new series, one that explores the savage madness the distant past. A time when the earliest men still walked in the shadow of the dinosaur. 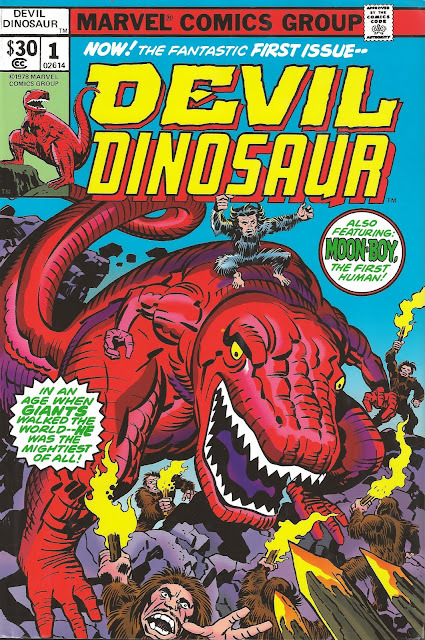 Devil Dinosaur #1 debuts in April 1978. On the cover, Devil Dinosaur charges forward, his tiny human hands clutching, yellow eyes blazing with a mad light. The hairy Killer-Folk cower in fear, their torches and spears dwarfed by the reptilian rage that speeds toward them with the force of a hurricane. On his back, Moon Boy's arms rise toward the sky, silently pushing his companion on. A boy and his dinosaur striking out against the world that hates and fears them: Vintage Marvel at its finest. But even with the ever explosive Kirby at the reins, the first issue is surprisingly low on mad ideas--despite the impossibility of man and dinosaur truly living side by side, Kirby chooses to depict the setting with some restraint. In the back of the issue, he preemptively defends himself against charges of inaccuracy. Perhaps it is possible, he argues, for a world such as he has created to exist. "After all," he writes in the back-matter, "just where the Dinosaur met his end, and when Man first stood reasonably erect, is still shrouded in mystery." From anybody else, this would be a ludicrous assertion. But the world Kirby is creating, like every world he has created, transcends mere fact. The world of Devil Dinosaur is a feverish pulp of television and comics and drive-in movies, as distinct from the real world as T. rex from a toy. No dinosaur skeleton could ever fit inside Devil Dinosaur's grotesque body. 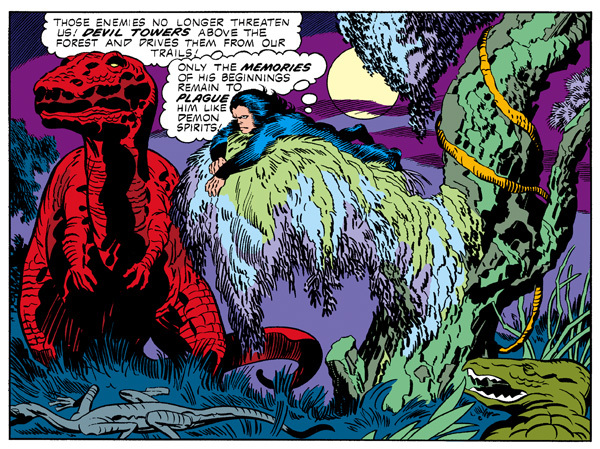 No prehistoric forest ever burned with the spatters of energy that Kirby inks over every vista. Reality and evidence are hindrances to a mind like Kirby's. It's clear that even pseudo-scientific speculation isn't enough to restrain him for long. And it doesn't. Barely two issues have passed before the horizons of Devil Dinosaur's prehistoric world expand into stranger epochs. The spider god of the Killer-Folk. The valley of the malevolent ants. A prehistoric giant clad in ragged fur and a triceratops skull, swinging a stegosaurus like a club. There is talk of an animated spin-off, a television show for children. It's a natural transition--Devil Dinosaur is a child's id writ large across cheap paper, insane and logic-defying and gloriously energetic. But even that's not enough. 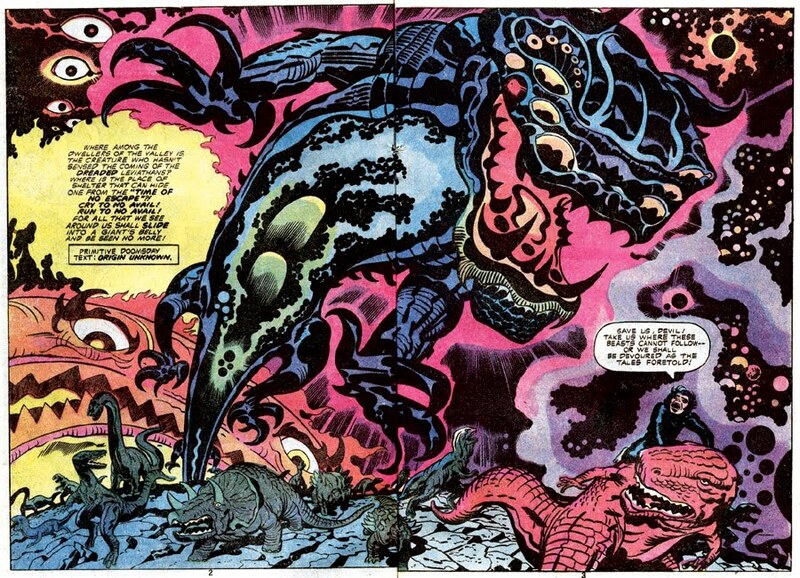 Kirby's pen takes Devil Dinosaur onward, upward, outward; attacking aliens, strange technology, Kirby krackle star-beasts of Lovecraftian size, the very cosmos taking life in a sea of staring eyes and claws and seething power. The World That Was and The World That's Coming are beginning to blend together. Devil Dinosaur goes into space. Devil Dinosaur magically rampages through the distant future of 1978. Devil Dinosaur stands supreme. December 1978. Devil Dinosaur is canceled. The art is too stylized and strange, the writing too uneven and clunky. Comics buyers are ignoring it in droves. Low sales, that impossible enemy, do to the red giant what rival monsters and jet-pack aliens never could. Devil Dinosaur #9 is the last issue. The hoped-for animated spin-off never arrives. A crossover between Devil Dinosaur and Godzilla is plotted in a last-ditch attempt to drum up some interest, but it comes and goes with nary a ripple. Kirby moves on. It's what he does; he's had too many series canceled out from under him to weep over one more. Bereft of their creator's pen, Devil Dinosaur and Moon Boy are left rudderless in the backwaters of Marvel's continuity. The World That Was withers, a discarded toy in Marvel's toy-box, to be plucked out and desultorily played with and then cast back and forgotten. One more occasional guest star and another casualty of the changing comics industry. Too strange. Too weird. Comics are for grown ups, these days. 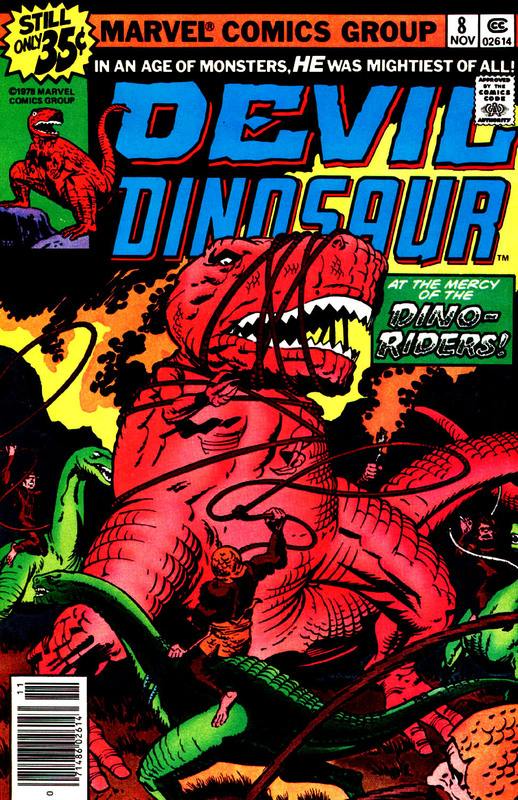 But for nine insane, glorious issues, Devil Dinosaur was the mightiest of all. Next Time! 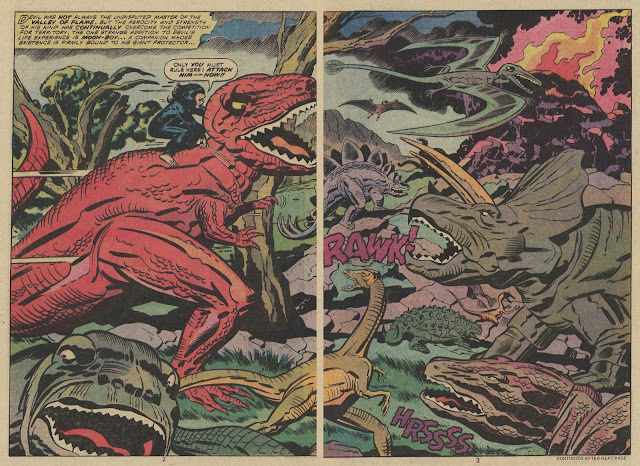 The many faces of Devil Dinosaur! Random adventures! Smoking jackets! 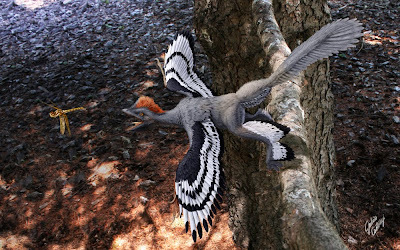 Anchiornis huxleyi © Julius Csotonyi, used with permission of Titan Books. I hope that you've enjoyed reading this week's long tag-team style review of Titan's new Dinosaur Art: The World's Greatest Paleoart. While our individual tastes naturally effected our feelings on the book, overall LITC heartily endorses it. I keep my copy in my workspace, and I love having it handy to get a little inspiration. I can turn to an artwork - say, Raul Martin's 2008 diplodocids spread on pages 172-173 - and focus on a single aspect. Right now, I'm appreciating Martin's rendering of these titans' feet. 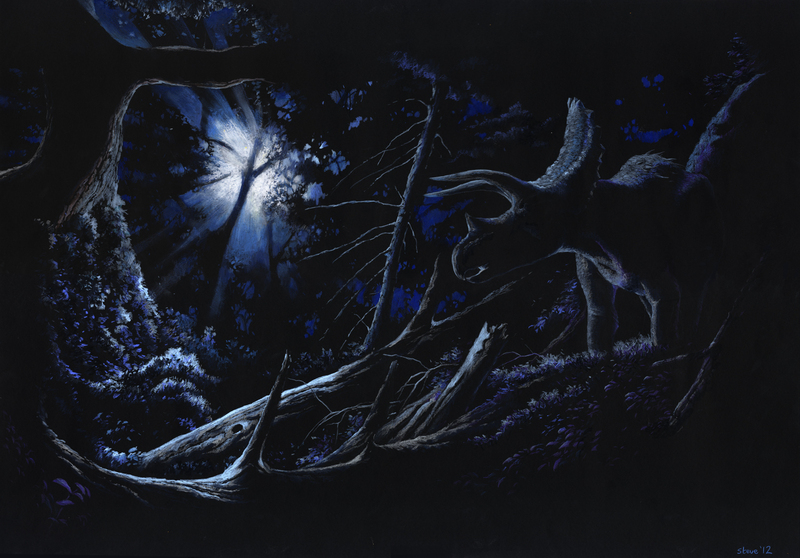 These brief excursions away from the task at hand are an important part of my creative process, and having large-format print pieces of paleoart within arm's reach is wonderful. I have to disagree on the subject of Greg Paul though. 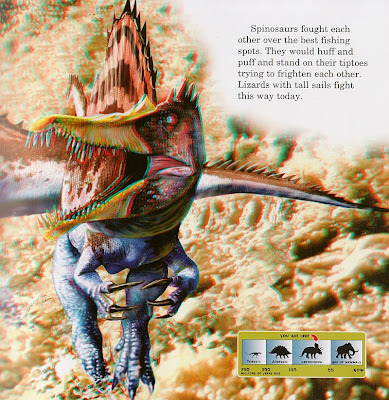 I think his colour work can be great, and unique amongst palaeo stuff. 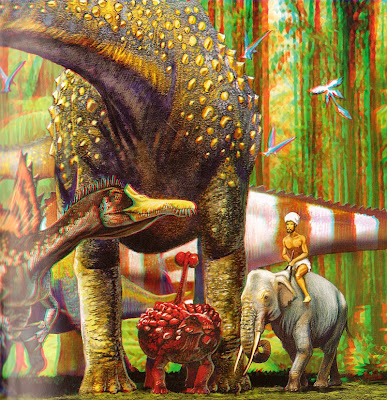 I especially enjoy his flat collage-like style that you see in the Omeisaurus in a forest painting and the Shunosaurus-Gasosaurus fauna piece (both of these are in the book). I would love to produce some things like that. Also, including anyone but Doug Henderson over Greg Paul would have been a massive error, in my opinion. 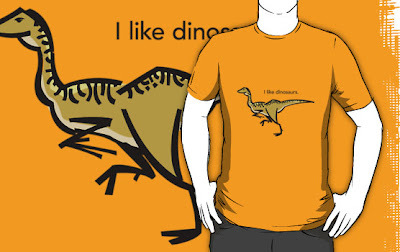 He's clearly the most influential palaeontological artist, leaving him out would be silly. I've grown accustom to Greg's old oil technique--it is a unique Winslow Homer/Hopper/Grandma Moses painting style. Flat indeed, but perfect executions of first-revealed anatomy and animal interactions--if sometimes a little crowded. I think his technique has since evolved. The wild thing about Greg's old work is that the originals are gone--buried under repeated modifications to the original paintings. I can't quite get my head around the willingness and severe unsentimentality to just cover over one's earlier work. I wish there had been more of Greg's color work in the book--it was and still is a major foundation to a modern visual representation of reconstructed animals, plants and environments--a fountain we have all been dipping our cups in, whether acknowledged or not. I do prefer GSP's older color work, having explored some more of it again, and seeing there was a bit more depth to it. I thank Henderson by giving me some historical reference to put him into better context. But I stand by my opinion that the GSP color work selected for Dinosaur Art is outshone by most of the other work in the book. Different strokes, I suppose. I'll be interested to see if anyone else weighs in about this as more people get the books in their hands. What would be really fun would be a career-spanning review of GSP's work, but if you don't have every publication he's done, it's virtually impossible, as his site only features the work locked up in slideshows. Elasmosaurs and Pteranodon © Douglas Henderson, used with permission of Titan Books. Yeah, Marc used it too. How could I resist? In all, though we all had some criticisms, Dinosaur Art gets the LITC stamp of approval, a prestigious and much sought-after award. 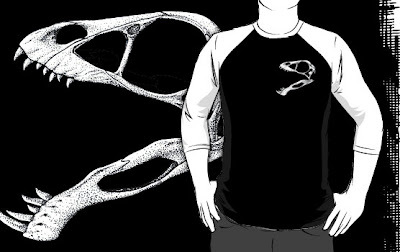 Its high quality and reasonable price make it ideal as a present for paleontology enthusiasts of any age. I can imagine unwrapping this as a child and losing myself for hours in the art, and as I grew up with it on my bookshelf, gaining valuable insight from White's essay and the artist interviews. I don't need to sell this to LITC's core audience: we all have been inspired by paleoart. 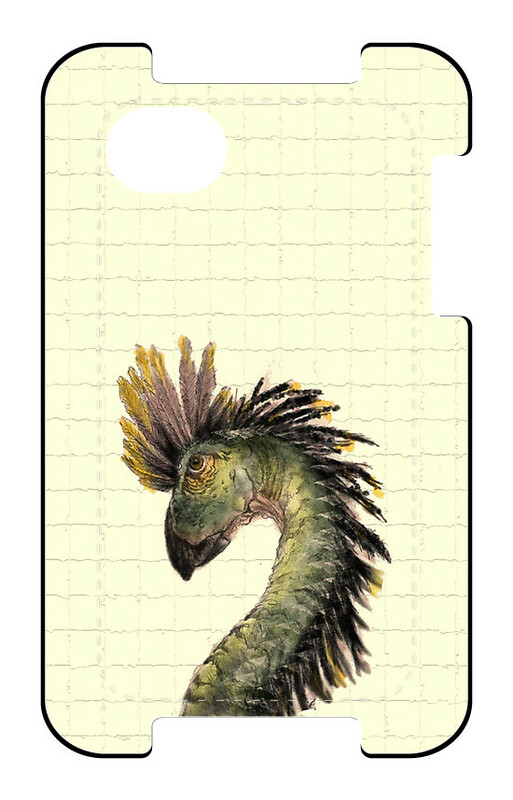 But if you've wandered into this strange little corner of the web and there's a young boy or girl in your life who's dinosaur-mad: put Dinosaur Art in their hands. They'll learn the story of Leonardo the Brachylophosaurus and know the animal through Julius Csotonyi's haunting death portrait. They'll feel the weight of herds of sauropods. They'll dive into Paleozoic and Mesozoic seas, meeting bizarre arthropods, enormous marine reptiles, and titanic fish. That's a lasting value that far outweighs its modest cover price. Finally, LiveScience has done an interview with Steve White, as well as a brief slideshow of some of the featured work. 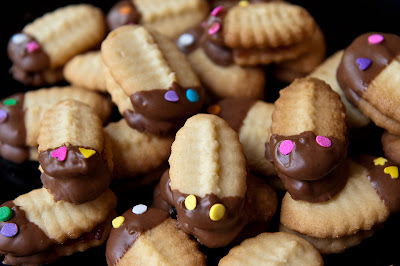 What better way to welcome our newest LITC writer, Asher Elbein, to the blog than to make him some nice cookies? Straight from the kitchen of Martha Stewart, after all. They are simple impressions from "food safe" plastic toys, and invite the possibility of illustrating the history of life in delicious, sugary form. 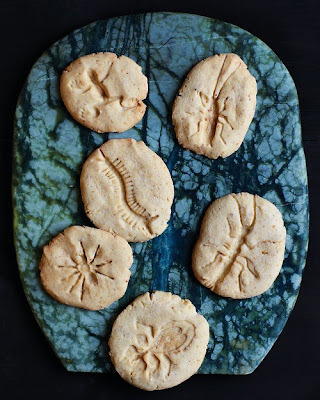 Or to get really geeky with it, you could illustrate all sorts of ichnofossils: footprints, burrows, feeding traces... What I'm saying, Martha, is that you could take these fossil cookies to the next level. Isn't that what we've come to expect from you? Photo by Simon Watson, from Marthastewart.com. For something a directly inspired by fossils, these trilobite cookies look ridiculously tasty, but again, if your cookery skills are high enough, you could go nuts by making these accurately depict different taxa of trilobites. The less skilled among us might stick to agnostids. Or broaden your scope. 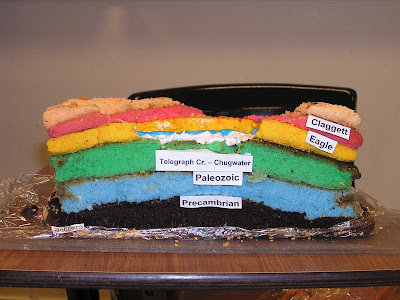 You can never go wrong with a big, beautiful geology cake. Just be careful, them geologists be picky.